The Ukrainian alphabet is the set of letters used to write Ukrainian, the official language of Ukraine. It is one of the national variations of the Cyrillic script. The modern Ukrainian alphabet consists of 33 letters. In Ukrainian, it is called українська абетка (IPA: [ukrɐˈjinʲsʲkɐ ɐˈbɛtkɐ]; tr. Ukrayins’ka abetka), from the initial letters а (tr. a) and б (tr. b); алфавіт (tr. alfavit); or, archaically, азбука (tr. azbuka), from the acrophonic early Cyrillic letter names азъ (tr. az) and буки (tr. buki). Ukrainian text is sometimes romanised: written in the Latin alphabet, for non-Cyrillic readers or transcription systems. See romanisation of Ukrainian for details of specific romanisation systems. There have also been several historical proposals for a native Latin alphabet for Ukrainian, but none have caught on. The alphabet comprises thirty-three letters, representing thirty-eight phonemes (meaningful units of sound) and an additional sign: the apostrophe. Ukrainian orthography (the rules of writing) is based on the phonemic principle, with one letter generally corresponding to one phoneme. The orthography also has cases in which semantic, historical, and morphological principles are applied. In the Ukrainian alphabet the "Ь" could also be the last letter in the alphabet. Twenty letters represent consonants (б, г, ґ, д, ж, з, к, л, м, н, п, р, с, т, ф, х, ц, ч, ш, щ), ten vowels (а, е, є, и, і, ї, о, у, ю, я), and two semivowels (й/yot, and в). The soft sign ь has no meaning when written by itself, but when written after a consonant, it indicates that the consonant is soft (palatalized). Also, alveolar consonants are palatalized when followed by certain vowels: д, з, л, н, р, с, т, ц and дз are softened when they are followed by a "soft" vowel: є, і, ю, я. See iotation. The apostrophe negates palatalization in places that it would be applied by normal orthographic rules. It also appears after labial consonants in some words, such as ім'я́ "name". And it is retained in transliterations from the Latin alphabet: Кот-д’Івуар (Côte d'Ivoire) and О’Тул (O'Toole). There are other exceptions to the phonemic principle in the alphabet. Some letters represent two phonemes: щ /ʃt͡ʃ/, ї /ji/ or /jɪ/, and є /jɛ/, ю /ju/, я /jɑ/ when they do not palatalize a preceding consonant. The digraphs дз and дж are normally used to represent single affricates /d͡z/ and /d͡ʒ/. Palatalization of consonants before е, у, а is indicated by writing the corresponding letter є, ю, я instead (but palatalization before і is usually not indicated). ge (ґ), used for the less-common velar plosive /ɡ/ sound, whereas in Ukrainian the common Cyrillic г represents a glottal fricative (similar to Dutch g), /ɦ/. yi (ї) /ji/ or /jɪ/. The apostrophe is similarly used in Belarusian orthography, while the same function is served in Russian by the hard sign (ъ): Ukrainian об'єкт and Belarusian аб'ект vs. Russian объект ("object"). The Cyrillic script was a writing system developed in the First Bulgarian Empire in the tenth century, to write the Old Church Slavonic liturgical language. It was named after Saint Cyril, who with his brother Methodius had created the earlier Glagolitic Slavonic script. Cyrillic was based on Greek uncial script, and adopted Glagolitic letters for some sounds which were absent in Greek — it also had some letters which were only used almost exclusively for Greek words or for their numeric value: Ѳ, Ѡ, Ѱ, Ѯ, Ѵ. The early Cyrillic alphabet was brought to Kievan Rus’ at the end of the first millennium, along with Christianity and the Old Church Slavonic language. The alphabet was adapted to the local spoken Old East Slavic language, leading to the development of indigenous East Slavic literary language alongside the liturgical use of Church Slavonic. The alphabet changed to keep pace with changes in language, as regional dialects developed into the modern Ukrainian, Belarusian and Russian languages. Spoken Ukrainian has an unbroken history, but the literary language has suffered from two major historical fractures. 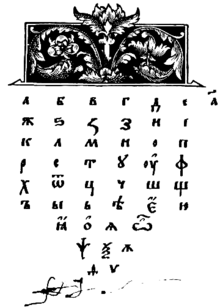 Various reforms of the alphabet by scholars of Church Slavonic, Ruthenian, and Russian languages caused the written and spoken word to diverge by varying amounts. Etymological rules from Greek and South Slavic languages made the orthography imprecise and difficult to master. Meletiy Smotrytsky's Slavonic Grammar of 1619 was very influential on the use of Church Slavonic, and codified the use of the letters Я (ja), Е (e), and Ґ (g). Various Russian alphabet reforms were influential as well, especially Peter the Great's Civil Script of 1708 (the Grazhdanka). It created a new alphabet specifically for non-religious use, and adopted Latin-influenced letterforms for type. The Civil Script eliminated some archaic letters (Ѯ, Ѱ, Ѡ, Ѧ), but reinforced an etymological basis for the alphabet, influencing Mykhaylo Maksymovych's nineteenth-century Galician Maksymovychivka script for Ukrainian, and its descendent, the Pankevychivka, which is still in use, in a slightly modified form, for the Rusyn language in Carpathian Ruthenia. 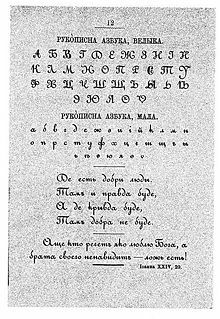 In reaction to the hard-to-learn etymological alphabets, several reforms attempted to introduce a phonemic Ukrainian orthography during the nineteenth century, based on the example of Vuk Karadžić's Serbian Cyrillic. These included Oleksiy Pavlovskiy's Grammar, Panteleimon Kulish's Kulishivka, the Drahomanivka promoted by Mykhailo Drahomanov, and Yevhen Zhelekhivsky's Zhelekhivka, which standardized the letters ї (ji) and ґ (g). A Ukrainian cultural revival of the late nineteenth and early twentieth centuries stimulated literary and academic activity in both Dnieper Ukraine and western Ukraine (Austrian-controlled Galicia). In Galicia, the Polish-dominated local government tried to introduce a Latin alphabet for Ukrainian, which backfired by prompting a heated "War of the Alphabets", bringing the issue of orthography into the public eye. The Cyrillic script was favoured, but conservative Ukrainian cultural factions (the Old Ruthenians and Russophiles) opposed publications which promoted a pure Ukrainian orthography. In Dnieper Ukraine, proposed reforms suffered from periodic bans of publication and performance in the Ukrainian language. One such decree was the notorious 1876 Ems Ukaz, which banned the Kulishivka and imposed a Russian orthography until 1905 (called the Yaryzhka, after the Russian letter yery ы). The Kulishivka was adopted by Ukrainian publications, only to be banned again from 1914 until after the February Revolution of 1917. The Zhelekhivka became official in Galicia in 1893, and was adopted by many eastern Ukrainian publications after the Revolution. The Ukrainian National Republic adopted official Ukrainian orthographies in 1918 and 1919, and Ukrainian publication increased, and then flourished under Skoropadsky's Hetmanate. Under the Bolshevik government of Ukraine, Ukrainian orthographies were confirmed in 1920 and 1921. In 1925, the Ukrainian SSR created a Commission for the Regulation of Orthography. During the period of Ukrainization in Soviet Ukraine, the 1927 International Orthographic Conference was convened in Kharkiv, from May 26 to June 6. At the conference a standardized Ukrainian orthography and method for transliterating foreign words were established, a compromise between Galician and Soviet proposals, called the Kharkiv Orthography, or Skrypnykivka, after Ukrainian Commissar of Education Mykola Skrypnyk. It was officially recognized by the Council of People's Commissars in 1928, and by the Lviv Shevchenko Scientific Society in 1929, and adopted by the Ukrainian diaspora. The Skrypnykivka was the first universally adopted native Ukrainian orthography. However, by 1930 Stalin's government started to reverse the Ukrainization policy as part of an effort to centralize power in Moscow. In 1933, the orthographic reforms were abolished, decrees were passed to bring the orthography steadily closer to Russian. His reforms discredited and labelled "nationalist deviation", Skrypnyk committed suicide rather than face a show trial and execution or deportation. The Ukrainian letter ge ґ, and the phonetic combinations ль, льо, ля were eliminated, and Russian etymological forms were reintroduced (for example, the use of -іа- in place of -ія-). An official orthography was published in Kyiv in 1936, with revisions in 1945 and 1960. This orthography is sometimes called Postyshivka, after Pavel Postyshev, Stalin's official who oversaw the dismantling of Ukrainization. In the meantime, the Skrypnykivka continued to be used by Ukrainians in Galicia and the worldwide diaspora. During the period of Perestroika in the USSR, a new Ukrainian Orthographic Commission was created in 1987. A revised orthography was published in 1990, reintroducing the letter ge ґ. It also revised the alphabetical order, moving the soft sign ь from the end of the alphabet, to a position before the letter ю, which helps sort Ukrainian text together with Belarusian (following a proposal by L. M. Ivanenko of the Glushkov Institute of Cybernetics). Transliteration is according to the scholarly transliteration system used in linguistics. For other systems, see romanisation of Ukrainian. ^1 The pronunciation of /w/ varies depending on context; it is labial before back vowels and labiodental before front vowels. It is also vocalised to [u̯] in the syllable coda. ^2 Ge (ґ) was officially banned in the Soviet Ukraine from 1933 to 1990; it is missing from some computer character encodings and fonts, such as ISO-8859-5 and MS-DOS Cyrillic. ^3 The soft sign (ь) indicates the softening (palatalization) of the preceding consonant letter. It was at the end of the alphabet before 1990, when the new official orthography changed its position. ^4 The apostrophe indicates that the consonant preceding a soft vowel is not palatalized, when it otherwise would be. ^5 There are also digraphs which are pronounced as a single sound: дж, which sounds like dg in knowledge, and дз. Examples: джмiль (a bumble bee), бджoлa (a bee), дзвоник (a bell). As in other Cyrillic alphabets, hand-written or cursive letters vary somewhat in form from their block-letter, or typeset upright, counterparts, particularly the letters г, д, и, й, and т.
Typographically, the small (lower-case) letters are very similar to small-caps versions of the capitals, although sophisticated faces may have a small-caps font which is different from the lower-case. A Cyrillic type face (шрифт, shryft) doesn't technically have "roman" or "italic" fonts, since these terms stem from West European history. It has upright (прямий, prjamyj) and cursive (курсивний, kursyvnyj, later also called письмівка, pys’mivka). Quoted text is surrounded by un-spaced guillemets (angle-quotes), or lower and upper quotation marks. Reference: Bringhurst, Robert (2002). The Elements of Typographic Style (version 2.5), pp. 262–264. Vancouver, Hartley & Marks. ISBN 0-88179-133-4. There are various character encodings for representing Ukrainian with computers. ISO 8859-5 encoding is missing the letter ґ.
KOI8-U stands for Код обміну інформації 8 бітний — український, "Code for information interchange 8 bit — Ukrainian", analogous to "ASCII". KOI8-U is a Ukrainianized version of KOI8-R.
Windows-1251 works for Ukrainian alphabet, as well as for other Cyrillic alphabets. Ukrainian falls within the Cyrillic (U+0400 to U+04FF) and Cyrillic Supplementary (U+0500 to U+052F) blocks of Unicode. The characters in the range U+0400–U+045F are basically the characters from ISO 8859-5 moved upward by 864 positions. In the following table, Ukrainian letters have titles indicating their Unicode information and HTML entity. In a visual browser you can hold the mouse pointer over the letter to see this information. Elements in HTML and XML would normally have the Ukrainian language indicated using the IETF language tag uk (lang="uk" in HTML and xml:lang="uk" in XML). Although indicating the writing system is normally not necessary, this can be accomplished by adding a script subtag, for example to distinguish Cyrillic Ukrainian text (uk-Cyrl) from romanized Ukrainian (uk-Latn). ^ "Use of Ukrainian Language, Serbia". Peter T. Daniels and William Bright, eds. [clarification needed] (1996). The World's Writing Systems, pp 700, 702. Oxford University Press. ISBN 0-19-507993-0. Volodymyr Kubijovyč ed. [clarification needed] (1963). "Ukrainian Writing and Orthography" in Ukraine: A Concise Encyclopædia, vol 1, pp 511–520. Toronto, University of Toronto Press. ISBN 0-8020-3105-6. Ivan Ohienko (1918). Nayholovnishi pravyla ukrayins’koho pravopysu. Kyiv, UNR Ministry of Education. Ivan Ohienko (1919). Holovnishi pravyla ukrayins’koho pravopysu. Kyiv, UNR Ministry of Education. All-Ukrainian Academy of Sciences (VUAN, 1920). People's Commissariat of Education (1921). (1928) Ukrayins’kyy pravopys. Kharkiv, Academy of Science of the Ukrainian SSR. (1936) Ukrayins’kyy pravopys. Kyiv, Academy of Science of the Ukrainian SSR. L. Bulakhovs’ky, ed. (1946). Ukrayins’kyy pravopys. Kyiv, May 8, 1945: Academy of Science of the Ukrainian SSR. (1960) Ukrayins’kyy pravopys. Kyiv, Academy of Science of the Ukrainian SSR. (1990) Ukrayins’kyy pravopys. Kyiv, Academy of Science of the Ukrainian SSR. (2007) Ukrayins’kyy pravopys. Kyiv, Naukova Dumka. Online version. (2012) Ukrayins’kyy pravopys. Kyiv, Naukova Dumka. Online version. (2015) Ukrayins’kyy pravopys. Kyiv, Naukova Dumka. Online version. Look up ukrainian alphabet in Wiktionary, the free dictionary. The Cyrillic Charset Soup — Roman Czyborra's site contains an exhaustive history of Cyrillic character set encoding schemes. Проєкт нового “Українського правопису” — Proposal for a new Ukrainian orthography (in Ukrainian). At the Encyclopedia of Ukraine: Cyrillic script, Orthography, Hrazhdanka, Maksymovychivka, Kulishivka, Zhelekhivka, Pankevychivka. Ukrajinśka Latynka is the online project that promotes Latin alphabet for the Ukrainian language. This page was last edited on 20 April 2019, at 03:56 (UTC).